Pam and I went to South of Beale for dinner and drinks and to check out the Zombie March. We were enjoying our meal when a zombie approached and, finding no suitable brains for eating at our table, went for my asparagus and bleu cheese risotto! Pam had to kill her with a fork. Fedoras off to the Majestic Grille on their film noir-themed fifth anniversary party last night. Complete with a jazz quartet, a swing band, a champagne toast, candy cigar and cigarette girls, and guests dressed to the nines in ’40s-style garb, the anniversary was a gangbuster event. Of course, there was food: cheeseburger sliders, fried green tomato sliders with bacon, an array of cheeses and charcuterie, homemade chips with blue cheese, and more. I've been around, but I'm not apologizing because I'm grown. Yet, after my visit to Pita Cafe, I do see the value of discretion. The owner Musa Mahmond asked, First visit here? ... Yes. ... Where else have you had pita? My list started. The owner's face fell. And then my list went on and on. Gary Gardo and his wife consider Ella Hernandez something of a daughter, but that hasn't stopped the trash-talking. Nope, not at all. That's because on Friday, during the Art Trolley Tour on South Main, it's Gary vs. Ella, neighbor vs. neighbor, in the "Taster's Choice" cook-off. Ella is the reigning champ, Gary the challenger. It's up to the tour's attendees to cast their vote for that evening's master chef. A sign up at Johnny G's Creole Kitchen at 156 Beale presented without comment. Cortona Contemporary Italian recently began serving lunch from 11 a.m. to 2 p.m. Friday through Sunday. Pam is reviewing the restaurant for Memphis magazine, and I got to tag along. I went downtown today to check out the Great Food Truck Race ... and nothing. I couldn't find them. 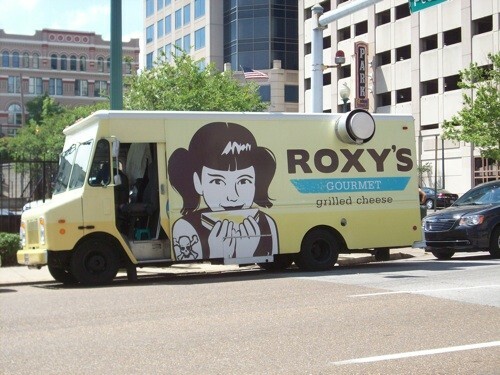 I was about to give up when I spotted Roxy's Gourmet Grilled Cheese. They were setting up shop at Main and Peabody Place, which is where Hodge Podge is supposed to be, though they're running late. Not sure about Korilla BBQ, which was scheduled to be in Handy Park. Perhaps I missed them. If you have any info, share it in the comments. Terrifying, isn't it? This is a Sarah Palin-esque artwork titled "We're Havin' a Tea Parody" by J. Taylor Wallace. It's also a functional cooker and is one of the pieces included in the National Ornamental Metal Museum's "Art Cooker: Taste/See" exhibit running May 20th-July 24th. On Friday, May 20th, 6-9 p.m., the pieces will be fired up for an opening reception and barbecue. Alison Ouellette-Kirby, who curated the show with her husband Noah Kirby, took the time to answer some questions. Tags: National Ornamental Metal Museum, "Art Cooker: Taste/See"
Lazy Cakes Relaxation Brownie made it onto Gawker early this morning. The Perennial Plate is an online documentary series on sustainable and adventurous eating hosted by Daniel Klein with Mirra Fine behind the camera. The show, which is syndicated on Huffington Post, focused its first season on Minnesota. But now Klein and Fine are taking The Perennial Plate on a six-month road-trip all over the United States. Today, they're in Memphis. On Saturday, Big Bob Gibson Bar-B-Q was named Grand Champion of the World Championship Barbecue Cooking Contest. Big Bob Gibson's Carolyn McLemore talked about competing in Memphis on Thursday. On Wednesday, May 18th, Clandestino, a group out of Chicago that puts on underground dinner parties, is holding an event in Memphis. This location is undisclosed, only to be revealed 24 hours before the dinner. Clandestino's Lauren Parton (pictured second from the right), however, revealed it to me. This sign for parking is at an apartment building on East Parkway, just north of Central. The man I spoke with said his stepfather owns the buildings, and that the Barbecue Fest is the first time they dabbled in the parking business. Chris Lilly of Big Bob Gibson Bar-B-Q in Decatur, Alabama, is competing at Barbecue Fest. He's also working the rounds as the official pitmaster of Kingsford Charcoal. Chris is a renowned barbecuer — a cookbook author, two-time Barbecue Fest Grand Champion, a contestant on Food Network's Best in Smoke. So I ask him about selling out to Kingsford. He politely laughs at my very rude joke and notes he'd been using Kingsford since he started barbecuing, years before the company approached him.